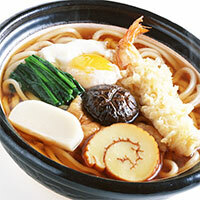 Nebayaki-udon is a fast made dish coming to us from the land of the setting sun. Noodles are a big part of what makes this dish, so you really want to get your hands on a pack of pre boiled udon noodles - they come in frozen and hard variety. Frozen ones have had fewer additives to preserve the flavor, so they are somewhat healthier. What separates this hot pot is the fact that it goes with greenery, usually spinach, and there are far too few traditional dishes that use spinach. Leek, eggs and chicken or fish - all of these things are pretty useful in your day-to-day diet. However, the noodles make this dish still count as pastry, which makes Nabeyaki-udon a nice treat that doesn't take a lot of time to make, but it's still something you want to avoid due to it's high calorie count. The calories in Nabeyaki-Udon per 535g(1 cup) is 519 calories. Nabeyaki-Udon is calculated to be 97Cal per 100 grams making 80Cal equivalent to 82.47g with 71.96g of mostly carbohydrates、26.59g of protein、11.77g of fat in 535g while being rich in vitamins and minerals such as Selenium and Sodium.